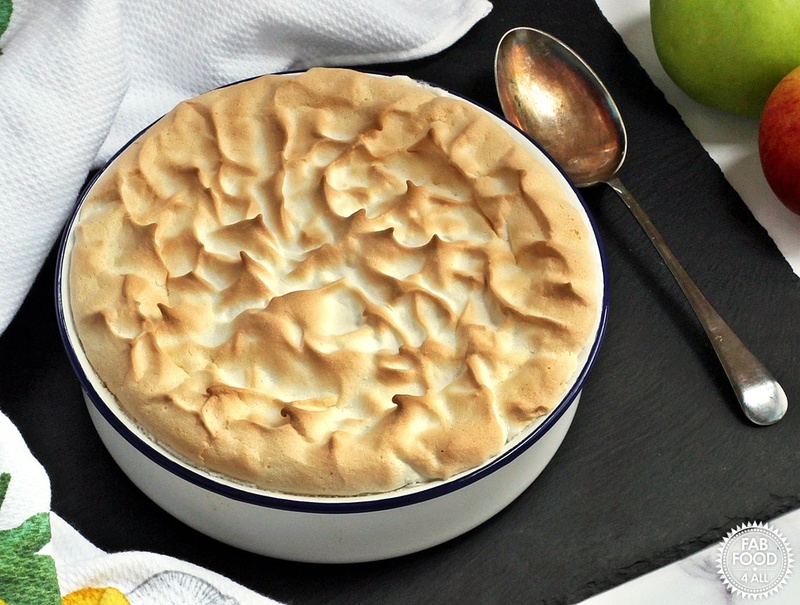 I’m very excited to be sharing my Vegan Apple Meringue recipe with you today. 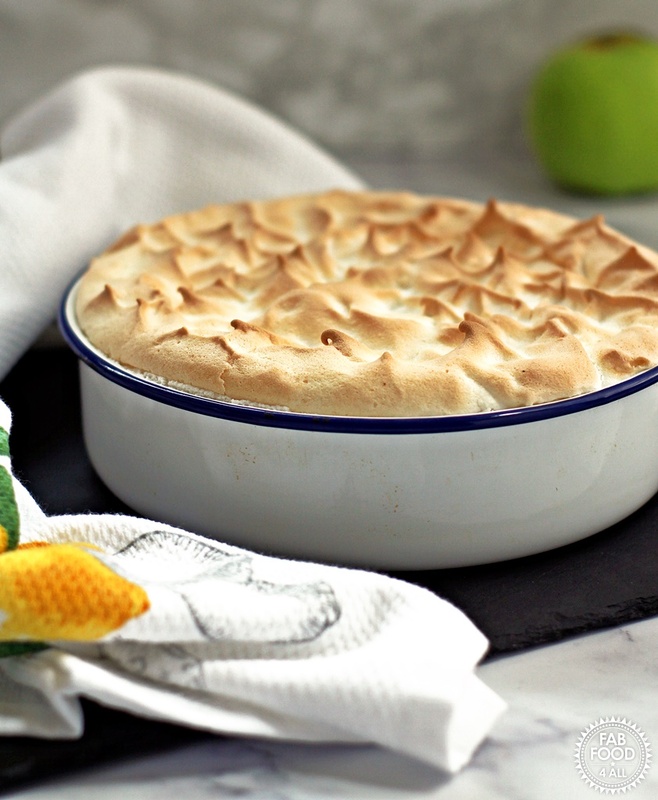 I was going to re-shoot my Apple Meringue recipe a couple of weeks ago but then my oven broke down. So the apples I’d bought went on to become my Cheat’s Danish Apple Cake (Gammeldags Æblekage) (a dessert) which didn’t need the oven! In the time that passed and having got the oven working again, I stumbled across vegan meringues made with aquafaba (drained chickpea water) which I’d never seen before. A light bulb moment then struck! Aquafaba is used as a replacement for egg white and can be used in all manner of sweet and savoury creations including mousses, mayonnaise, cakes, pancakes etc. For more information and history do check out the Aquafaba website. Armed with my new-found knowledge, I set about trying to convert my Apple Meringue recipe which uses eggs to one which uses aquafaba as I love a challenge. It was a bit of a labour of love as I’d only ever used aquafaba once before for a recipe development that I didn’t pursue. 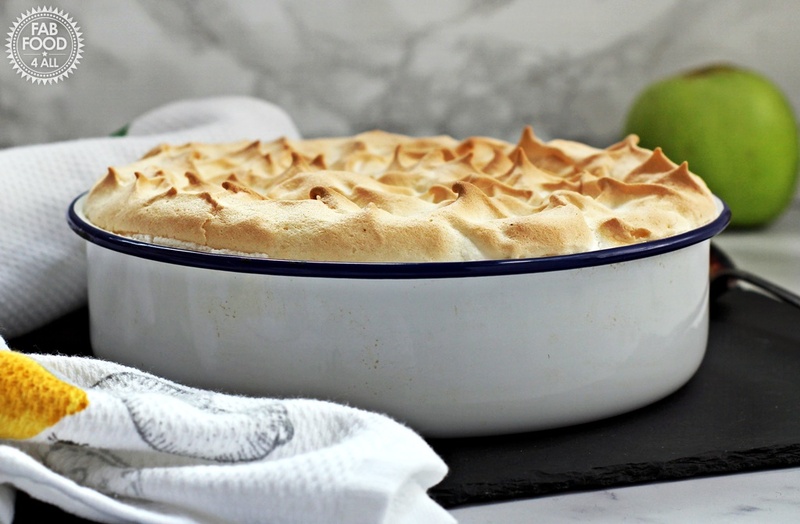 But I was determined to get this recipe perfected as Apple Meringue is one of our favourite quick desserts; I couldn’t see anything like it suitable for vegans so thought I should plug this void! 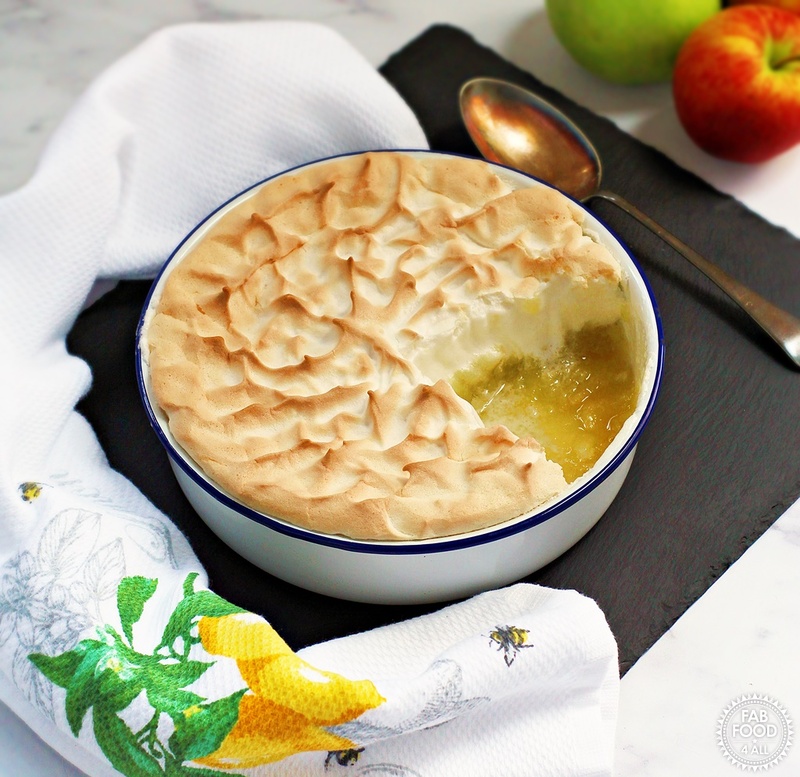 So what did I learn about using aquafaba in my Vegan Apple Meringue? Aquafaba whips is more quickly if you use cream of tartar and an electric whisk or stand mixer with glass bowl are essential. The best way to check that the aquafaba is whisked enough is to tip the bowl upside down once you have stiff peaks. If it stays put it’s ready for the next stage (adding the sugar). Depending on the brand of chickpeas you use, you may have more or less sediment in the drained water. 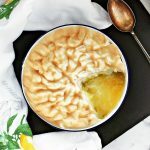 More sediment means the aquafaba will take a little longer to whisk into fluffy, stiff white peaks and the volume of fluff will be reduced (which isn’t a problem, but just something to be aware of if you go from one brand to another and notice a change). I found branded chickpeas had more sediment and supermarket own had less. (The pictures I shot were done using aquafaba from branded chickpeas but when I used supermarket ones the meringue rose higher on baking as I assume the aquafaba held more air due to there being less protein sediment). The resulting meringue layer is not as “firm” as that on the Apple Meringue I make with egg whites, it’s fluffier. 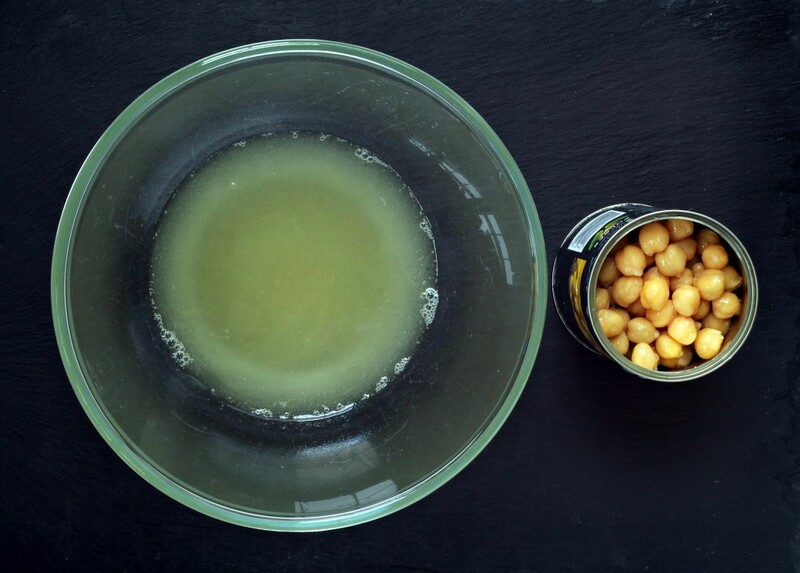 What can you use the leftover chickpeas for after using the aquafaba? Leftover chickpeas can be made into a quick salad with some chopped up peppers, red onion and a French dressing or popped into a curry like my Mushroom, Spinach & Chickpea Curry, which is how I used up my chickpeas! What other fruit or filling could you use in place of Bramley apples? You could use dessert apples (just reduce the amount of sugar) or any stewed fruit you like and tinned fruit or pie filling would work well too. I used a couple of tins of rhubarb in one of my trial runs which was also yummy! What other vegan desserts can be made using aquafaba? I do hope you try my Vegan Apple Meringue! Let me know what you think in the comments below. 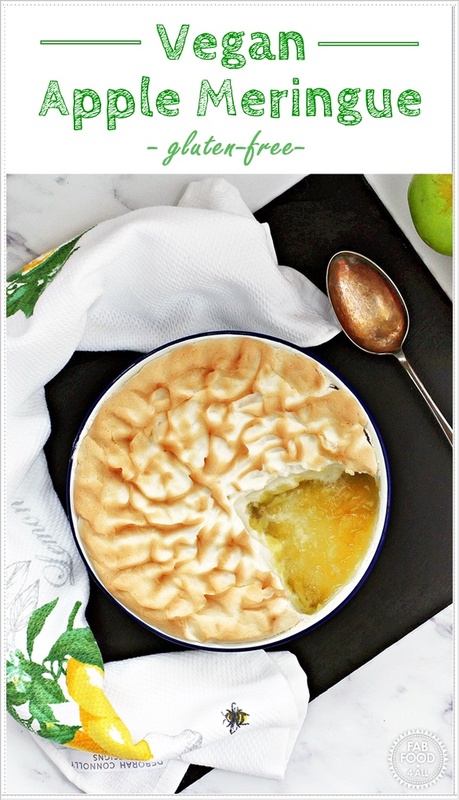 Vegan Apple Meringue is a quick and easy gluten free, family friendly dessert. 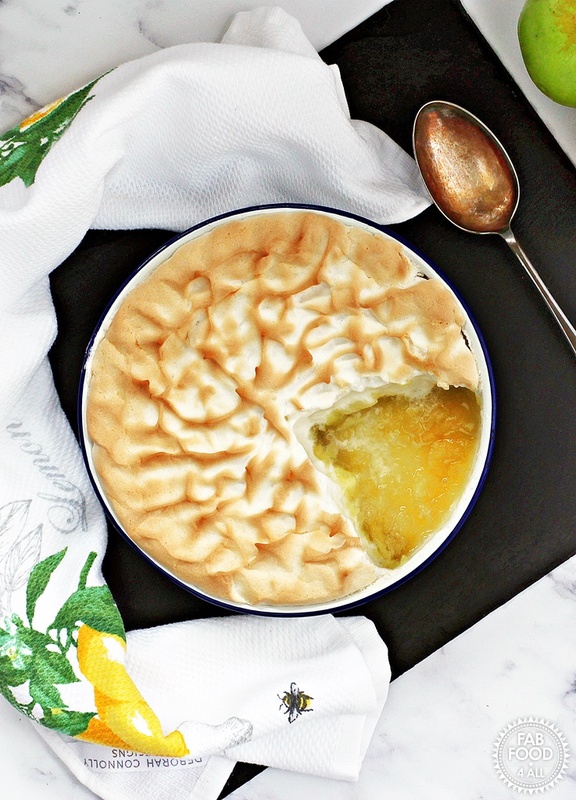 A layer of sweetened stewed apples is topped with a fluffy cloud of meringue made with aquafaba! Peel, core and quarter the apples, then cut each quarter into 4 slices and place in saucepan filled with water. Drain off water, then add 1 tbsp of water, sugar and lemon juice. Place on a medium heat, pop on a lid and stir occasionally until apples are cooked (about 10 mins). Add the aquafaba and cream of tartar to a spotlessly clean glass bowl and whisk with an electric whisk on high until stiff peaks form (can take anywhere between 3 – 6 minutes). You know it’s ready once you can hold the bowl upside down without it moving. Then gradually add 1 dessert spoon of sugar at a time and carry on whisking (adding to the opposite side of your whisk stops it flying out of the bowl) until all the sugar is incorporated and you have a smooth glossy meringue. By now your apples are ready so tip into heat proof serving dish and spread out evenly. Next tip the meringue out on top of the apples and spread out with a spatula. You can pat the spatula across the top to make ruffles or just have a smooth finish if you prefer. Then place on a baking tray and bake in the oven and bake for 15 minutes or until lightly golden and crisp on top. (Don’t over bake or the meringue may burst out over the sides so keep an eye on it). Thanks Kellie, I see they’re making aquafaba meringues on BakeOff next week so I’m excited to see that! Gosh, isn’t it amazing? I love all the other ideas you’ve included too. Time to start experimenting. We have lots of apples and lots of tins of chickpeas!